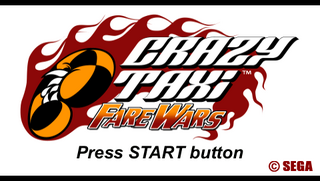 Crazy Taxi: Fare Wars, known as Crazy Taxi: Double Punch (クレイジータクシー ダブルパンチ) in Japan, is a PlayStation Portable game, which is a port of both Crazy Taxi and Crazy Taxi 2. There is also a multiplayer aspect which was not available in the games' predecessors. The game was developed by newly created Sniper Studios. The game allows custom soundtracks; MP3 files stored on the memory stick can be played in-game. The game contains all the modes available in its Dreamcast predecessors. Licensed franchises are no longer in the game and only referred to as stores, restaurants, etc. Music by Bad Religion and The Offspring are replaced with original punk songs. Unlike its predecessors, the game has been rated "E10+" by the ESRB instead of "T". The soundtrack is usable between both Crazy Taxi and Crazy Taxi 2. In addition, the game allows the use of customized soundtracks located in the music folder on a PSP Memory Stick. Main article: Crazy Taxi: Fare Wars/Magazine articles.